One of our customers recently called reporting a power failure in their Ottawa Yard Truck. Senior Field Service Technician Kory Swenson headed out in one of our mobile repair vehicles to diagnose and repair it. After hooking up the laptop to the Ottawa Truck, it was quickly determined that there was an issue with the truck's ECM. In this truck there is an Ottawa oil pressure sending unit and a Cummins oil pressure sending unit. The diagnostic computer determined that there was a problem with the Cummins oil sending unit. Kory saved the customer hours of down time not having to read through the Cummins manual and go through every step to discover the problem. 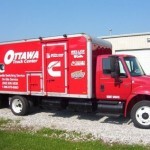 Most of our customers realize that we sell and service Ottawa Trucks. They also know they can call us to order parts for those trucks but they don’t always realize we do other things too. When we say other things we mean: mobile welding, semi-trailer maintenance, Cartage services, or general truck repairs and maintenance. Many have no idea that we have the ability to buy and sell used vehicles and to do service work onsite with our mobile service trucks. We are going to use our new blog to highlight lesser known services we’ve added to our quiver over the years.